At about the same time as Volkamer was doing his studies on Bizzarria plants in Germany, this was also done by the merchant and garden lover, Pieter de la Court van der Voort, in Leiden (Netherlands). Like Volkamer he owned some Bizzarria trees and observed their growing and development over some years. His description of the plants (in Byzondere aenmerkingen over het aenleggen van pragtige en gemeene landhuizen, lusthoven, plantagien en aenklevende cieraeden, 1737) was even more detailed and comprehensive than those of Volkamer. 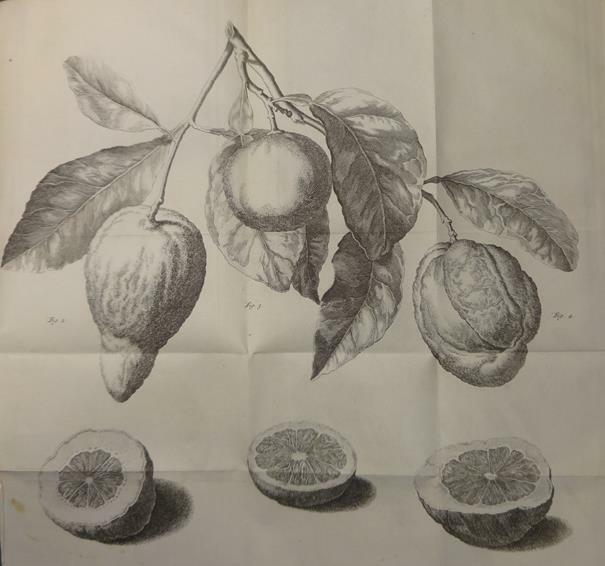 He also mentioned, that besides the mixed parts the Bizzarria plants could consist of pure Citron or pure sour Orange components. And so he represented the Bizzarria on the related engraving as a branch with 3 different fruits and their half parts. One of the Botanists , who had also a closer look to Bizzarria plants at that time, was Paolo Bartolomeo Clarici . In his Istoria e coltura delle piante (1726) he attempted to classify the different shapes of Bizzarria fruits. Like Volkamer, Clarici beliefed that three different components are blended together in a Bizzarria fruit. He classified 7 different categories of fruits, according to the shares of sour orange (C. aurantium), citron (C. limonimedica) and lemon (C. lemon). However, his classification did not succeed, and was doubted by later authors. A fundamental question which the botanists of the time concerned was the origin of the bizzarria. Some believed that the bizzarria had been produced naturally, as a "miracle of nature". Other saw it as a result of special ingenious gardening. To the latter also belonged Clarici. But he refused the theory of producing the Bizzarria by grafting embryos or seeds of oranges and citrons together and he required to examine the events more closely and not to settle for a seemingly close but superficial explanation.